The UK has more people aged over 60 than under 16 for the first time, figures released from the 2001 national census show. The census also revealed there were now 1.1 million people aged over 85 - a fivefold increase on the 1951 survey. 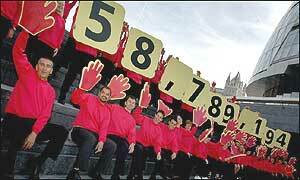 The overall population of the United Kingdom on the day of the census - 29 April, 2001 - was 58,789,194 - about one million lower than estimates made in mid-2000. The once-a-decade population survey provides a snapshot of the shape of the UK. The overall UK population was 17% higher than in 1951, but this growth was lower than the European Union average of 23% and far below the growth in the United States (80%) and Australia (133%) over the same period. England's population has risen 5% in the past 20 years, but the shifts show marked regional differences. The South East and South West shot up by more than 10%, while the North East and North West declined. The census also gave details of gender differences, revealing that women were increasing their majority over men. Whereas in the past women only began to outnumber men from the late 40s and over, now there are more women than men in all age brackets from 22 onwards. Census officials said that improved health-care and living standards had contributed to the ageing population. The proportion of over 60s has risen from 16% to 21% of the population in the past 50 years, while the proportion of under 16s has fallen from 24% to 20%. Help the Aged urged the Government to do more to address the needs of older people. The census said Scotland's population had declined 2% over the past 20 years, while Wales was down 3% over the same period. Northern Ireland bucked the trend, with the biggest increase of all - 9% since 1981 - and it also has the youngest population. In England and Wales, the fastest-growing region over the past 20 years was Milton Keynes (+64.4%), while Manchester had the biggest decline (-15.1%). Office of National Statistics (ONS) officials said the overall population figure was smaller than expected because of ''the great difficulty in calculating immigration and especially numbers of people leaving the country''. Len Cook, ONS England and Wales registrar general said the rave culture in the Mediterranean, expansion of higher education and "gap years", and a number of other factors might have contributed to a large number of people in their 20s who have left the UK. But the ONS expressed total confidence in the accuracy of the £255 million survey, calling it "the most accurate census result that could be achieved using the best methods available''. The project attracted criticism after it emerged the ONS added details of imaginary people to make it more complete. The census received only an 88% response and following a newspaper investigation Mr Cook was forced to admit staff had used "standard sampling techniques" to redress the balance. Every household was required by law to return the questionnaire about details of its inhabitants, or face a £1,000 fine. In a joint statement the three registrars general - Mr Cook, John Randall for Scotland and Norman Caven for Northern Ireland - said: "This census has proved both a landmark and a benchmark. It has been a world class exercise that has given us the most accurate picture possible of our population." The full census will not be released until 13 February 2003. The information gathered is used to help the government decide how to spend public money. The survey was more complex than usual this time, with new elements that included a question about religious denomination. A total of 23 million households were surveyed and 30 million census forms were printed. "We are an ageing nation"
"Every 10 years the government organises a reliable headcount"